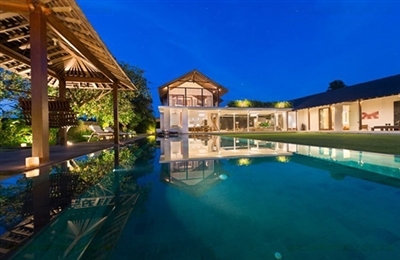 Villa Coco Groove boasts chic, minimalist tropical living in a spacious garden setting. 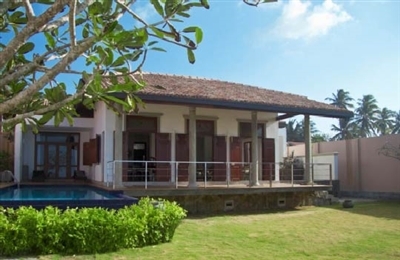 We found the villa to be very peaceful considering it’s situation in a compact residential area, near to Seminyak’s restaurant and shopping districts. The grassed coconut grove and large swimming pool provided an attractive focal point for our days of relaxation and we agreed that the vast gardens (a rarity for villas in this sought-after area), make Coco Groove a great place for functions and parties, or for families with kids who need lots of space to let of steam. 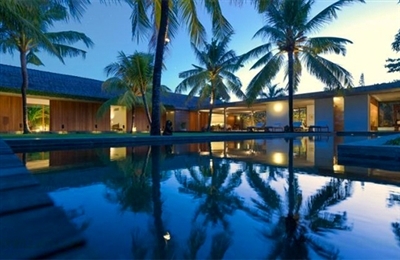 Really, this villa is suitable for all age groups and offers exceptional value for money. The villa is a fabulous blend of old and new. We particularly liked the Sarawak theme in the lounge; the back wall is adorned with baby carriers, masks, parang knives, oars and blowpipes of ethnic groups from the Borneo region, such as the Dayak, Iban and Orang Ulu. You can read all about them in a number of the books found in a small, but eclectic library in the master bedroom. Whilst the TV lounge is functional, the small screen and limited seating engineers it more towards a reading room or study (there are no TVs in the bedrooms either). We found the staff (total seven) professional, friendly and speak good English. They live out, however hours are flexible depending on your needs, and with three security guards there is always someone on hand. Babysitters and masseurs are available on request at additional charge. The chef excelled in all the meals he prepared for us. You can choose from an extensive suggestion menu and the staff will do the provisioning (a small charge is made to cover petrol). A well-thought-out information book informs you of the day-to-day operations of the villa and recommends day trips which can be arranged by the staff, whilst also giving great advice on local attractions. Kavya's clever design encouraged us to divide our time equally between the various spaces on offer. It was as pleasant reclining on the wide sofa looking out over the lawn as it was lying on a sunbed by the pool, swinging in the hammock with a book, or retreating to the cool of the TV room to watch a movie. After enjoying our first delicious lunch so much, mealtimes became something to look forward to. The chef applied every one of his 15 years of resort and cruise ship experience to cook up a storm and with everything from local specialties to Italian and fusion food on the suggestion menu, it was as if Seminyak's best chefs had all been invited to make a guest appearance. 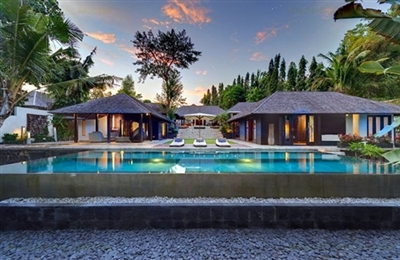 Despite the slick, minimalist design we found Villa Kavya easily met our practical needs and families would certainly enjoy all the facilities on offer, as would a group of young hip urbanites on a party weekend. The wide, central lawn is large enough to throw a frisbee, have a picnic on or even pitch awnings for a garden party and when it rained briefly the aroma of cut grass evoked memories of bygone summers. The three on-site staff were discreet yet available, which left us free to choose our favourite places and diversions during the day, coming together at mealtimes around the square dining table. After dinner, appetites appeased, the TV addicts slipped off to the TV room, the rest of us happy to recline, chat and enjoy the balmy Balinese evening. Villa Mata Air occupies an incredibly peaceful and picturesque spot, where the only sounds come from birdsong and flowing water. There are plenty of spaces for quiet contemplation, like the riverside deck, cushion-filled bale, and hidden temple gardens. The design is attractive, contemporary and comfortable, but it’s really the enchanted setting that seals the deal at Mata Air. I am hardly a tree buff, but found myself deeply enamoured with the lush, leafy giants wrapped in webs of ropey vines that perfectly framed the pool and created the most tropical of vistas. The neat design of pavilions and manicured lawns contrast well with the wilder riverside aspects, where untamed foliage creates a ‘back to nature’ setting. The riverside studio pavilion is a fabulous addition; as a bedroom it makes for a private romantic hide away, alternatively, as an additional lounge area, it’s a great place to relax and enjoy the views and the sounds of the gurgling river. The complimentary driver was great when we were in the mood for a change of pace, even if it was just a meal down at Echo Beach. This Robinson-Crusoe-meets-Roberto-Cavalli villa is sensational! Not usually prone to hyperbole, we consider it nigh on impossible not to be bowled over by the entire ‘barefoot luxury’ Villa Voyage experience. From the moment we caught sight of the dramatic sea vista beyond the living room, we were completely hooked. We lazed on sun loungers and beanbags by the pool, enjoyed siestas on the mezzanine bedroom balcony, and slumbered within the “I had a farm in Africa” tent bed, soothed by the pounding surf. The staff looked after us brilliantly, serving us a delicious breakfast every morning in the beachfront gazebo, and a three-course candle-lit dinner (tenderloin steak for him, sea bass for me) accompanied by the best chips in Bali! (Ingredients – which are charged to guests at cost plus a 30% shopping fee - are boated in from the mainland fresh every day, so we were asked to make our menu selection ideally 48 hours in advance). We could have happily stayed put at the pool, so deeply relaxing is the Voyage experience! But the villa’s open-sided van, and jukung (outrigger) encouraged us out of our indolence, and we loved exploring the island – next time we’ll make a point of diving with the manta rays! We also dipped into the beach club next door for a tasty lunch, and strolled along the cliff tops – Dream Beach is only ten minutes away, and the restaurants of Mushroom Bay not much further. Would we return to Villa Voyage? In a heartbeat! 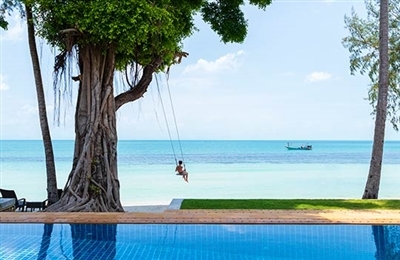 We felt so privileged to be among its first guests, and think that, once word gets out, this tropical island hideaway is going to get booked solid – by families and groups of friends. 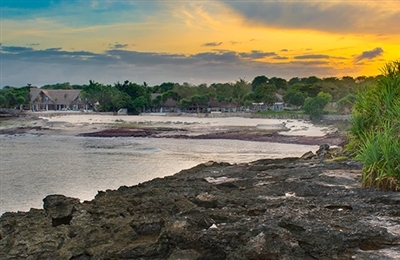 Waimarie is one of the most homely villas we have inspected. It’s incredibly well thought out for families, with absolutely loads to do even on a rainy day (heaven forbid). What really struck us as sensible is that all the day-time lounging areas make the most of the beach and views, whilst the bedrooms are set behind in lovely mature gardens which provide more privacy. The bedrooms are so practical for families – connecting rooms, twin with kings, but each still having a huge bathroom. Perhaps the connecting door could be a bit more sound-proofed. The baths are huge enough to take five or six kids (or two adults) with ease. Use the shower every other day to appease your environmentally-aware conscience. The common areas are excellent – a little well used in places but not in a frustrating way. There are loads of places to curl up in with a good book but also keep an eye on proceedings. Home away from home is a much overused term but we think this is very applicable for Waimarie. Warm, friendly, secure and incredibly homely.